Nashville, TN – The Tennessee Titans picked up Penn State defensive tackle Austin Johnson Friday with the 43rd overall pick in the second round of the 2016 NFL Draft. At the NFL Combine, the 6’4″ 314 pound Johnson ran a 5.32 second 40 yard dash and had a 26 inch vertical jump. 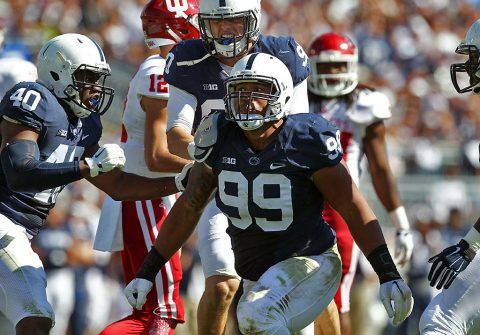 Johnson started 13 games for the Penn State Nittany Lions racking up 15 tackles for loss and 6.5 sacks. He returned a fumble 71 yards for a touchdown against San Diego State. He was selected All-Big Ten by the media, named to ESPN.com All-Big Ten Team and earned All-Big Ten from the Associated Press and Athlon Sports. Johnson is good in the trenches with strong, quick hands that enable him to win on first contact, more times than not. He is good along the line of scrimmage and has excellent technique for run stopping. He has great instincts and awareness for the ball and can fight through blocks to get to the play.